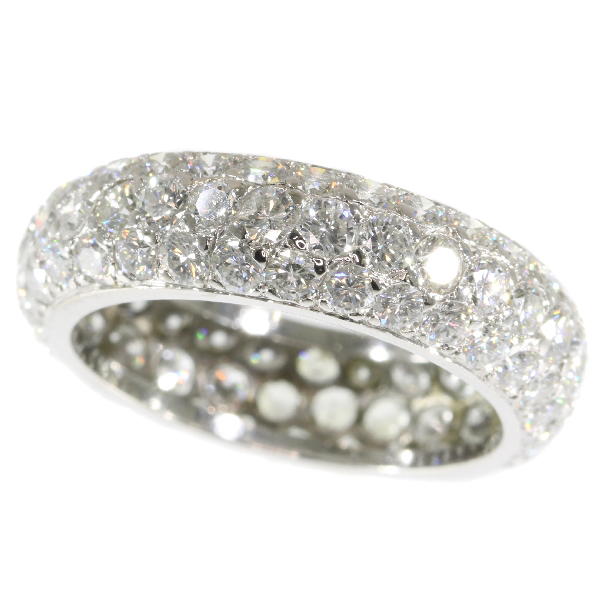 Vintage eternity band with over 5 crts of brilliant cut diamonds (90 stones! ): Description by Adin Antique Jewelry. Extra information: Eternity Band - Diamonds are forever, but only since the last 60 years or so. Although it is said that the tradition of diamond engagement rings and eternity bands go back a few thousand years, it was not till the mid Twentieth Century that they became the tradition we now know them to be. How they became part of a tradition is, all sugar-sweet stories of romance and ever-lasting-love aside, an interesting story. In the late 1930's de Beers the, then, world monopolist for diamonds, in an attempt to reduce their growing stock of diamonds, started a now historic advertising campaign. Out of the need to sell the bulk of their "big" stones the idea of proposing marriage with a one-diamond engagement ring was born. Before that there simply wasn't a link between a marriage proposal and a one-stone-diamond ring. Some twenty years later de Beers had a (secret) agreement with the former Soviet Union as sole channel for diamonds found there. The diamonds coming from Russia, although being better in quality, were much smaller in size. And what was better to get rid of a lot of smaller diamonds in one time? And thus the eternity band was born. Diamond(s): 30 brilliant cut diamonds with an estimated weight of ± 2.10ct. (colour and clarity: G/I, vs/si). 60 brilliant cut diamonds with an estimated weight of ± 3ct. (colour and clarity: G/I, vs/si). Total diamond weight: approx. 5.10 crt. with an average colour and clarity: G/I, vs/si. Resizing: This ring can be resized but only by adding or taking out stone(s). This resizing is NOT free and the size won't be exact but as close as possible. Eternity bands that are resized cannot be returned under the return policy.